According to rental site Zumper, median rents for a one bedroom in Rincon Hill are hovering around $4,200, compared to a $3,215 one-bedroom median for San Francisco as a whole. So how does the low-end pricing on a Rincon Hill rental look these days--and what might you get for your money? We took a look at local listings for studios and one-bedroom apartments to find out what budget-minded apartment seekers can expect to find in the neighborhood, which, according to Walk Score ratings, is friendly for those on foot, is convenient for biking and is a haven for transit riders. Listed at $3,750/month, this one-bedroom, one-bathroom apartment, located at 400 Beale St., is 10.7 percent less than the $4,200/month median rent for a one bedroom in Rincon Hill. Building amenities include garage parking, a swimming pool, a fitness center, outdoor space, concierge service and storage space. In the unit, you'll find a mix of hardwood floors and carpeting, a balcony, a walk-in closet, in-unit laundry, a dishwasher and large windows. Cats and dogs are not welcome. 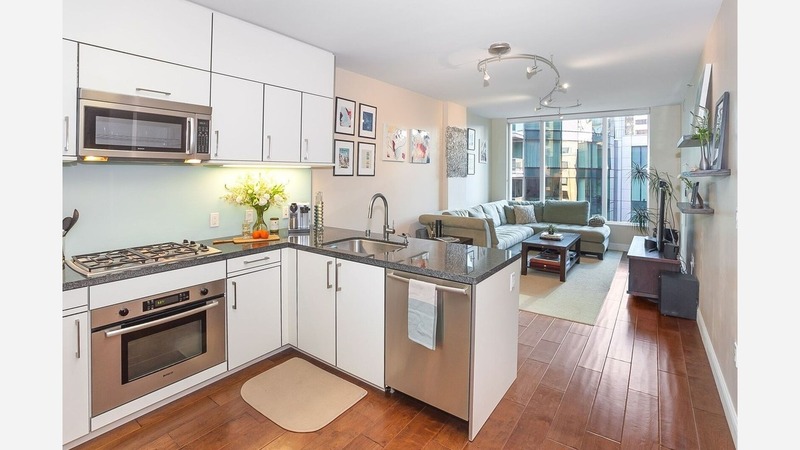 This studio apartment, situated at 401 Harrison St., is listed for $3,795/month. In the unit, you're promised a mix of hardwood floors and carpeting, in-unit laundry, a dishwasher, stainless steel appliances and floor-to-ceiling windows. When it comes to building amenities, expect a swimming pool, a fitness center, concierge service, outdoor space and a residents lounge. Cats and dogs are not welcome. Here's a listing at 338 Spear St., which, at 1,035-square-feet, is going for $4,195/month. The apartment features hardwood floors, a dishwasher, stainless steel appliances, a walk-in closet, a kitchen island and ample natural light. Building amenities include a movie room, a business center, a fitness center, a swimming pool, a residents lounge, secured entry and concierge service. Pets are not allowed. Then there's this 814-square-foot unit at 318 Spear St., listed at $4,200/month. The apartment features both air conditioning and central heating, a mix of hardwood floors and carpeting, a dishwasher, a walk-in closet, in-unit laundry and stainless steel appliances. Pets are not permitted. The building features assigned parking, a swimming pool, a fitness center, a business center, concierge service, an elevator, a door person, secured entry and on-site management. Listed at $4,400/month, this 835-square-foot studio condo is located at 333 Main St.
Building amenities include assigned parking, a swimming pool, a fitness center, a business center, concierge service, an elevator, a residents lounge and secured entry. In the unit, expect both air conditioning and central heating, hardwood flooring, in-unit laundry, a dishwasher, large windows and stainless steel appliances. Pet owners, inquire elsewhere: this spot doesn't allow cats or dogs.